For the cutting, grinding, and polishing of stone, marble, granite, masonry, concrete, and other materials, we carry a wide selection of angle grinders, die grinders, and air / water grinders. We carry top quality grinders by manufacturers including Makita, Alpha, and Gison. Angle Grinders are ideal for welders, masons, metalworking, construction, stone fabrication, maintenance / repair, and more. When choosing an angle grinder, important factors to consider are disc size and how powerful the motor is. Also take into consideration the power source (pneumatic or electric), rpm, and arbor size. Die Grinders are used to grind, sand, hone, polish, and machine materials. These grinders are often used in metal working but can also be used with wood and plastic. The attachments, or cutters, are similar to drill bits for drills and include mounted points, grinding stones, burrs, milling cutters, and abrasive cut-off wheels. More specialty power tools we carry include Drills, Portable Saws & Guide Rails, Sanders & Polishers, Mixers, Router Machines, and Air and Water Fed Tools. Dewalt 4.5" / 5" High Performance Grinder with Trigger Grip. Features 13.0 Amps and 9,000 RPM. Dewalt D28110 4.5" Small Angle Grinder with 7.0 Amps & 11,000 RPM for all purpose grinding and cutting. 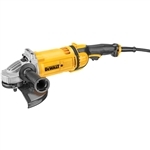 Dewalt DWE4559N 9" High Performance Angle Grinder with 4.7HP motor and lightweight design. GISON GPW-216 7,000 rpm Wet Air Grinder for Stone is widely used by stone fabricators for daily grinding, sanding of stone with diamond cup wheels and wet diamond core drilling. Makita’s 5” SJS™ Angle Grinder combines 13 AMP variable speed power with comfort and motor-protection features for longer-lasting stone grinding and polishing performance. Sale price good through 4/30. The Makita Sander Grinder GA7911 is a premium quality, single speed grinder that is excellent for commercial and industrial applications. Makita delivers corded grinding performance without the cord with the 18V LXT® Lithium-Ion Brushless 4-1/2" / 5" Cut-Off/Angle Grinder with Paddle Switch Kit (model XAG11T). The Makita 4.5 Grinder 9557PBX1's Labyrinth construction seals and protects the motor and bearings from dust and debris by creating a complex set of channels. 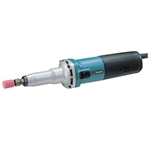 The Makita Die Grinder GD0601 is lightweight for controlled grinding operations. The Makita Die Grinder GD0800 is lightweight for controlled grinding operations. The GA4530 from Makita™ is a small diameter angle grinder ideal for custom body work or grinding overhead. The GA4534 from Makita™ is a small diameter angle grinder ideal for custom body work or grinding overhead. The Metabo PWE 11-100 4"/5" Wet Polisher is ideal for wet processing of granite, marble and other high-quality types of rock. The Metabo WEV 15-125 HT 5" Angle Grinder features optimum processing of stone: robust, powerful angle grinder with gear reduction and reduced, adjustable speed for material-friendly working. Makita’s 4-1/2" SJS Angle Grinder combines 13 AMP variable speed power with comfort and motor-protection features for longer-lasting stone grinding and polishing performance. Sale price good through 4/30. © Copyright 20165 StoneTooling.com. All Rights Reserved. Sold & shipped from USA.